Henrietta Hen is not the smartest hen on the block. In The Fox and the Hen, Henrietta lays an egg. When she's approached by the wily Red Fox, Henrietta cheerfully hands over her egg in exchange for a juicy worm. The rest of the animals on her farm know better and they inform Henrietta that she's made a big mistake. Her egg is precious and Red Fox will eat it. Warning: This is a spoilery review. But, if you're not a 4-year-old, it probably doesn't matter. Convinced that she must have her egg back, Henrietta goes on a mission. With the help of the other farm animals, she offers numerous other food items in exchange for her egg. Each time she is refused and the fox mentions a different manner of eating the egg -- poached, hard-boiled, scrambled, etc. Red Fox does a lot of thinking about how to prepare his egg. Eventually, Henrietta comes up with a plan. She'll find a bigger egg to use in trade. But, instead of an egg, she finds a large stone. The animals paint it and Henrietta offers it to Red Fox in exchange for her egg. The plan works and Henrietta's chick hatches the moment she and the egg are safe. I think I'm going to disagree with the Giant Online Book Retailer and say that this book could easily be read to children as young and fidgety as 18 months because it's a fairly short book. It probably just depends on the child. I read to mine when they were so small they couldn't roll over and I think the older the child who reads this, the more they'll question just how stupid it is for a hen to give away her own egg -- not a bad thing. Critical thinking skills start early. 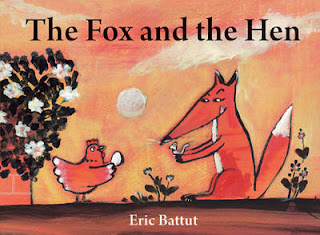 The illustrations are bold and eye-catching; the color scheme on the cover (heavily red) continues throughout The Fox and the Hen. Storyline: 3.5/5 - not so hot, but the sentences are simple and I do think this book would be great for starting readers, if the stupidity of the hen doesn't bother them. Illustrations: 4.5/5 - excellent; small children who are past the tearing stage will probably love to sit quietly and turn the pages, if only to enjoy the illustrations. This is #1 for Children's Day. More reviews of children's books forthcoming. This was one of my favorite books as a kid. Brings back memories...thanks for posting! That's so cool! I didn't realize the book has been around for a while; the earliest copyright in the book is listed as 2008. Thanks for sharing! I hope I made it clear that I think this book is terrific. The storyline may be rather ditzy, but that's not going to matter to small children. I can easily imagine my boys questioning the stupidity of the chicken by about 4 or 5 years of age; they didn't miss a thing. But they still would have loved it -- the illustrations are fantastic. Maybe you're thinking of the Little Red Hen? That's one of my old faves.